"Pepper rice and confetti beef that is mouth watering good." In a medium saucepan bring chicken broth to a boil. Add rice and stir. Reduce heat, cover and simmer for 20 minutes. Heat oil in a large skillet over medium heat, and cook the beef, red bell pepper, yellow bell pepper and green bell pepper until beef is evenly browned. Season with salt and pepper. Remove from heat. Stir Dijon mustard and honey in the beef mixture. Stir green onions into cooked rice. 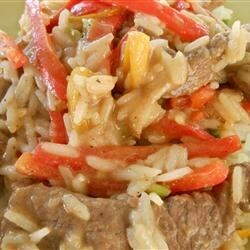 Serve peppers and beef over the rice. Fantastic quick dish with tastey results everyone loved! I used double the original ammount of honey and dijon mustard, as it did need a bit more sauce. My father loved it and has asked me to make it again, so, I thought this must be really good! and I, since then switched it to "family favorite" category. This was very good! Much to my suprise my children loved it. My husband said it had great flavor. We will have this again and agian.